You’ve been dieting for months, training for years, and meticulously tracking every single thing you do. Try as you might, the illustrious six-pack you’ve dreamt about night after night still eludes you. We’ve all experienced these frequent bouts of frustration when pursuing the physique holy grail that is the six-pack, and while most people will continue to say, “eat less, move more”, that’s not really what you need to do to get six pack abs. Normally, fat burners do little besides load you up with a bunch of crazy stimulants, making you “feel” like they’re working, but in actuality, they’re doing very little to help you get your vaunted six pack. The key to eliminating those last few pounds comes in limiting stress, which reduces cortisol, and insulin production, both of which support fat storage. By reducing these two important factors, you create the ideal fat burning environment to evaporate those last few pounds! How do you do limit stress and control insulin to maximize fat burning? With Steel Core! 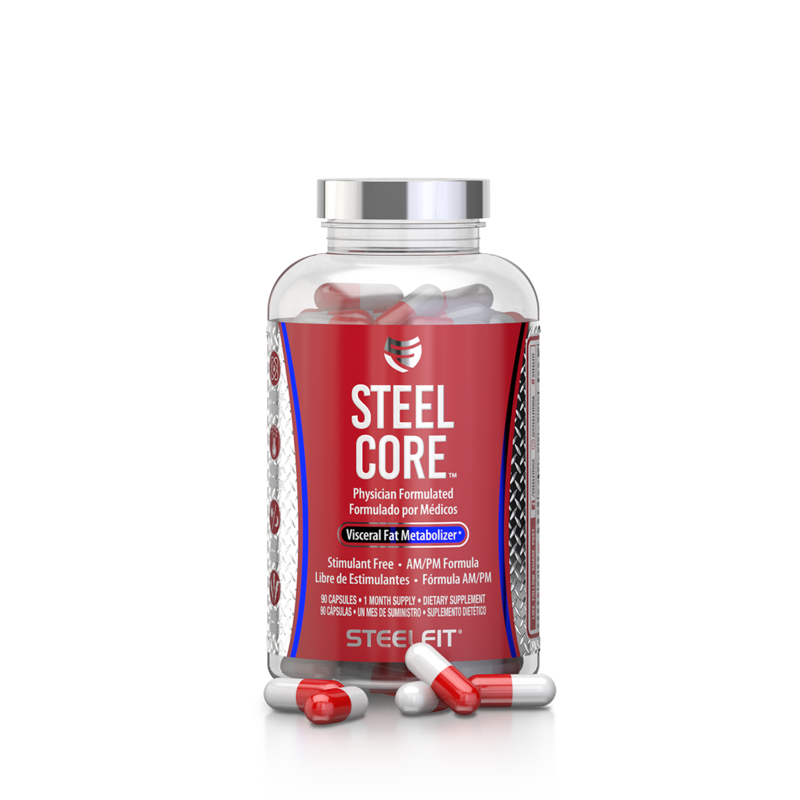 Steel Core is a revolutionary weight loss supplement scientifically formulated to help you get the shredded abs you’ve always wanted. Using a synergistic mix of ingredients that reduce fat storage and promote fat burning, Steel Core cranks up the intensity of your calorie burning for faster fat loss. Also included are several prominent cortisol and stress controlling agents, including KSM-66® Ashwagandha, that optimizes your hormonal levels for maximum fat loss. Why is Steel Core Better? Unlike other fat burners on the market that overload you with exotic, potentially dangerous, stimulants, leaving your feeling jittery and constantly “on edge”, Steel Core is stimulant free, including compounds that work naturally to increase thermogenesis, energy expenditure, and calorie burning. The end result is a fat burner that delivers actual results you can see in the mirror! L-Carnitine is an essential, naturally-occurring compound in the body that enhances your natural fat burning mechanisms by shuttling fatty acids into the mitochondria to be oxidized (“burned”) for energy. The reason Steel Core uses the L-Carnitine Fumarate form is that regular L-Carnitine isn’t all that useful for the average person unless they are chronically deficient in carnitine due to being vegan, vegetarian, or elderly. [1,2] Using this highly bioavailable form of carnitine promotes maximum fat burning and better energy production without the use of stimulants. A staple of Ayurveda, Ashwagandha is an incredibly powerful adaptogen that helps reduce stress and cortisol levels. Chronic stress promotes fat storage and can break down muscle tissue, the exact opposite of what you want when trying to get a Steel Core. Additionally, ashwagandha has also been shown to improve memory, boost testosterone, and improve athletic performance. [5,6] Steel Core uses the very best form of ashwagandha extract in KSM-66® which is backed by numerous clinical trials in humans demonstrating its extensive benefits. Dubbed “the universal antioxidant”, alpha lipoic acid (ALA) exerts powerful antioxidant effects in the body, which enhances mitochondrial function and combats inflammation. Moreover, alpha lipoic acid also helps drive glucose (carbs) into muscles and away from fat cells, making it a potent nutrient partitioning agent. This helps improve muscle repair and growth, reduce unwanted fat gain, and enhance energy production. The premier grains of paradise extract on the market, Paradoxine has been shown in numerous research studies to increase thermogenesis and energy expenditure by “browning” fat. In the body, there are two types of fat — white fat and brown fat. White fat is the stored form of energy the body uses as a source of fuel when calorie intake is low. FYI, this is the kind of fat you’re trying to burn when losing weight. Brown fat is used to generate heat and maintain core temperature. 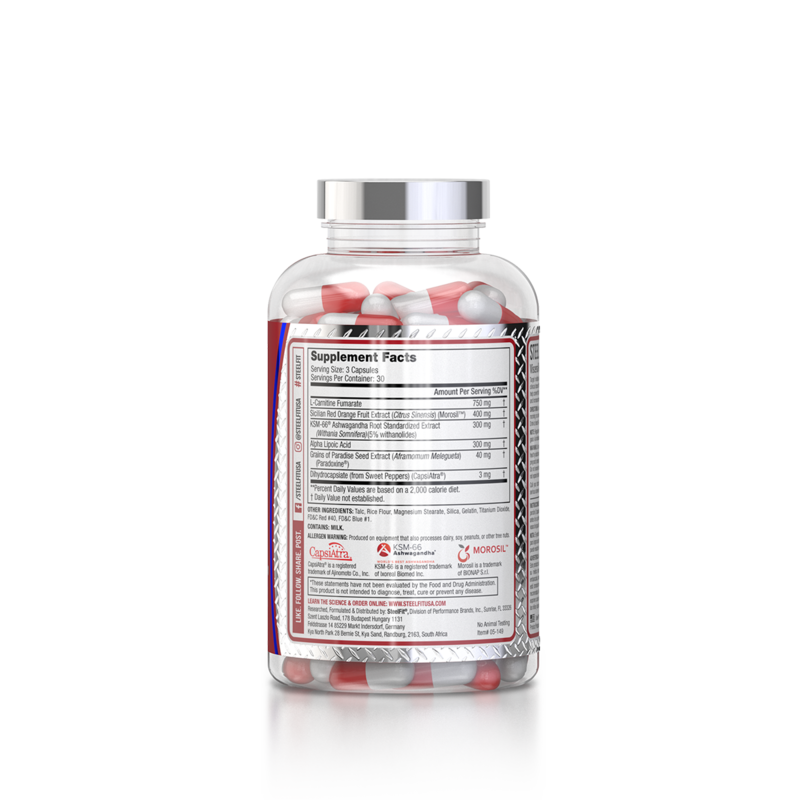 Paradoxine® helps “brown” white fat cells, making them burn calories instead of sitting around doing nothing but hurting your performance and body composition. [8,9] Browning fat increases metabolism and thermogenesis while decreasing visceral fat, especially in the lower abdomen, a notorious “trouble” spot for men and women. 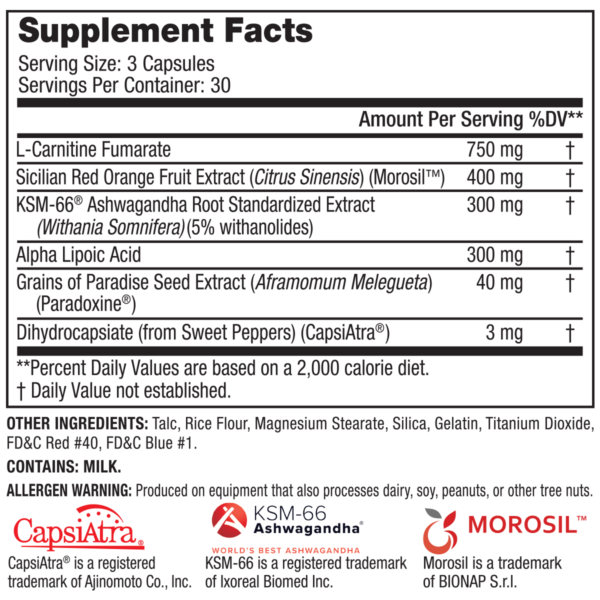 CapsiAtra® is a patented extract of sweet peppers standardized for Dihydrocapsiate. Humans studies have shown that this potent alkaloid increases fat burning and energy expenditure, helping you burn an additional 50 calories per day. The really interesting thing is that CapsiAtra® boosts your daily calorie burn without having to exercise or consume any form of stimulant! Inaguma T, Han J, Isoda H. Improvement of insulin resistance by Cyanidin 3-glucoside, anthocyanin from black beans through the up-regulation of GLUT4 gene expression. BMC Proceedings. 2011;5(Suppl 8):P21. doi:10.1186/1753-6561-5-S8-P21. Shay KP, Moreau RF, Smith EJ, Smith AR, Hagen TM. Alpha-lipoic acid as a dietary supplement: Molecular mechanisms and therapeutic potential. Biochimica et biophysica acta. 2009;1790(10):1149-1160. doi:10.1016/j.bbagen.2009.07.026. Kim SH, Plutzky J. Brown Fat and Browning for the Treatment of Obesity and Related Metabolic Disorders. Diabetes & Metabolism Journal. 2016;40(1):12-21. doi:10.4093/dmj.2016.40.1.12. Keep out of reach of children and pets. Do not use if safety seal is damaged or missing. Check with your doctor before using this product, especially if you are pregnant, nursing, have existing medical conditions or are taking prescription medications. Do not exceed recommended daily intake. Store at room temperature, tightly closed. Do not expose to excessive heat or moisture. Capsule (Gelatin, Titanium Dioxide, FD&C Red #40, FD&C Blue #1),Talc, Rice Flour, Magnesium Stearate and Silica. THIS PRODUCT CONTAINS MILK.